Born in 1835, he was appointed First Lieutenant, 1st Ohio Volunteer Infantry, on October 31, 1861. He was promoted to Major, Assistant Adjutant General, U.S. Volunteers, October 27, 1862 and to Lieutenant Colonel, Assistant Adjutant General, assigned January 31-August 31, 1865. He was breveted Brigadier General, U.S. Volunteers, for war service at Shiloh, Stones River, Resaca and Franklin. In 1862, he was General McCook's ordnance officer and in March 1863 was on the staff of General Schofield. He had been trained as a printer and went into the Regular Army for a time following the Civil War. He was later appointed the first Governor of Wyoming Territory and served as Third Assistant Secretary of State in Washington, D.C. 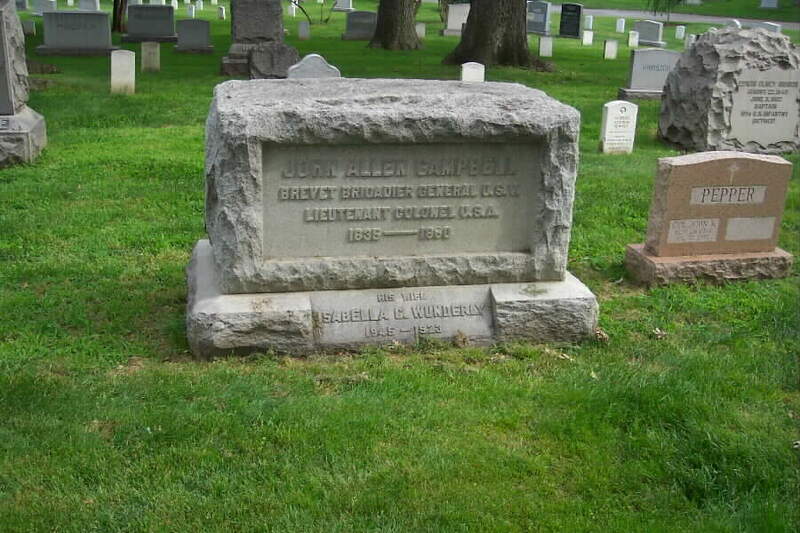 He died in 1880 and was buried in Section 1 of Arlington National Cemetery. 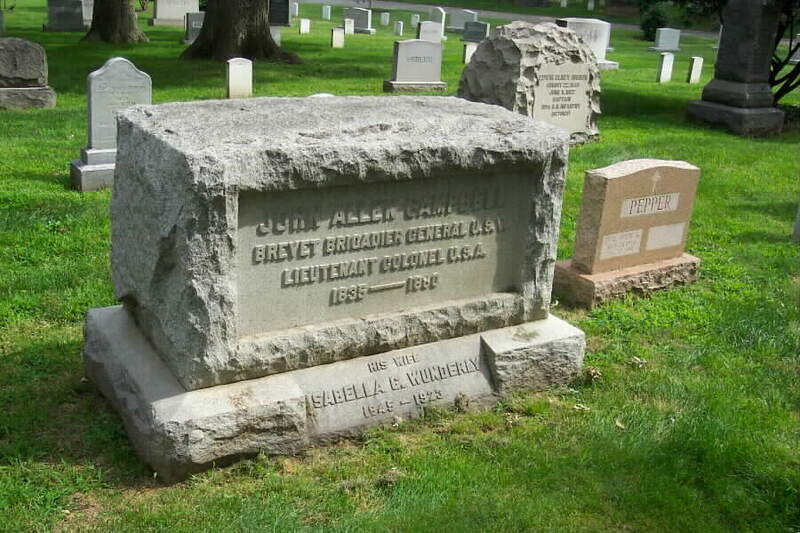 His wife, Isabella C. Wunderly Campbell (1845-1923) is buried with him. 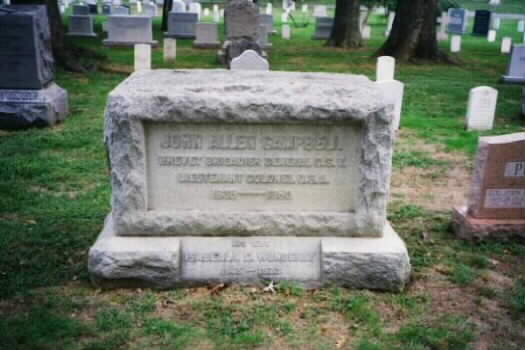 John Allen Campbell, soldier, born in Salem, Ohio, 8 October, 1835 : died in Washington, District of Columbia. 14 July, 1830. 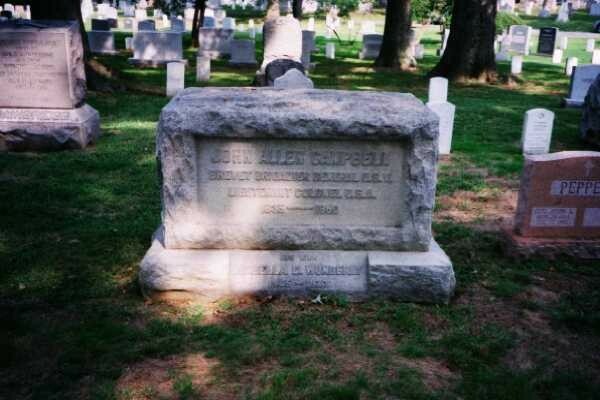 After receiving a common school education, he learned the printing business, and at the beginning of the Civil War entered the army as Second Lieutenant of volunteers. He became Major and assistant adjutant general, 27 October, 1862, and was breveted Brigadier General of volunteers on 13 March, 1865, "for courage in the field and marked ability and fidelity" at Rich Mountain, Shiloh, Perryville, Murfreesboro, and through the Atlanta campaign. He was mustered out on 1 September, 1866, and for a time assistant editor on the Cleveland "Leader." In October, 1867, he was appointed Second Lieutenant in the 5th Artillery, Regular Army, and at once breveted First Lieutenant, Captain, Major, and Lieutenant Colonel. He served on General Schofield's staff, but resigned in 1869, and was appointed the first Governor of Wyoming territory. He was reappointed in 1873. and in 1875 became Third Assistant Secretary of State at Washington, D.C.